The ultimate test...Rani Trader has finally been summoned by her exiled Glasswrights Guild, invited to test for the rank of master. Rani has craved such acceptance for years, and she has high hopes that all her past mistakes will finally be forgiven.Rani journeys to Brianta, the religious center of all the land. Soon, she is cut off from her long-trusted companions, isolated by the glasswrights who have long memories of past betrayals.Surrounded by religious fanatics, sickened by long hours of study, Rani soon realizes that she will be tested on far more than her knowledge of glassmaking--and the lives of loved ones hang in the balance. The storyline for this novel did not seem to make sense to me. It was all over the place. At first I thought we got to see things from Berylina's point of view because she would be instrumental to The Fellowship, but then she died. And I thought maybe Crestman reappearing would mean that Rani and Hal would be able to bring the Little Army home, but nope he's gone rogue. It seemed like the characters were all very out of character throughout this whole novel. I feel like the author was like, hm there are too many options for Rani so let's make sure they all become her enemy and/or die. 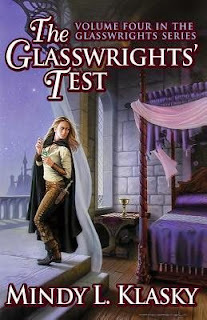 The whole story of Rani going to Britani for this test when the glasswrights hate her was just ridiculous. It felt like such a waste of my time to read this, even moreso than the last novel. The whole thing felt static except for the last two chapters where the story FINALLY progressed. I think that part of the problem has been the jumping in years between novels in which we don't see progress of the characters but they still seem to be the same people just with different background relationships. Overall: 2/5 stars. I'm glad this is over soon. It was a bit ridiculous if you ask me to have an entire novel based on this test and in the pov of two people who die. But what do I know.